The report says the fossil fuel industry is well-positioned to transition into low-carbon economy. 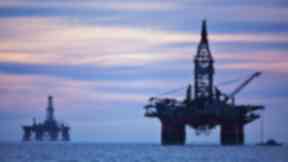 North Sea fossil fuels can be a key part of meeting the UK's climate change targets, according to a report for the oil and gas industry. The research into the future of the offshore oil and gas sector argues the UK's "comparative advantage in offshore technology" should help form part of a long-term energy strategy, along with carbon capture projects and a focus on hydrogen power. But setting out a longer term strategy, it highlights the need for the industry to embrace innovation and says "developing carbon capture and storage (CCUS) and the hydrogen economy based on oil and gas industry expertise has the potential to make the UK a global leader." It suggests the increase in renewable energy and efficiency improvements have while revealing 20% of the UK's oil and gas is used for power generation, and more than a third is used for transport. The findings of the report will be presented by its author Will Webster, energy policy manager at Oil & Gas UK, on Tuesday morning. Ahead of the speech, Mr Webster said: "This report demonstrates industry's key role in the energy transition and reinforces that Vision 2035, industry's ambition to add a generation of production to the UK North Sea and double the export opportunity for the supply chain, is critical in achieving the balance between delivering our climate change targets and ensuring security of energy supply. "As the report shows, despite the rapid advances in lower carbon technologies there is ongoing demand for oil and gas in several key areas including transport and domestic heating. "A total of 80% of the UK's 27 million homes are heated by gas, demonstrating the long-term importance of our industry in ensuring security of energy supply. "A lower carbon future will still require large scale energy distribution networks, undersea engineering and the mass movement and storage of gases and liquids." He added: "The role for carbon capture and storage and the development of hydrogen on an industrial scale will also feature in the future as these will be essential elements of any lower carbon environment. "Clear evidence for this was in the action plan recently published by the Government to deliver the UK's first carbon capture usage and storage projects by the mid-2020s. "The industry's expertise and use of pioneering technology means we are ready to play a central role in delivering cost effective, competently engineered solutions for CCUS."